The Fort Bend Independent School District’s Career and Technical Education Center (CTE) and the University of Houston College of Technology are working together to conduct innovation workshops at local high schools. Conducted at four high schools in November, the workshops are a preview of a new technology leadership and innovation management academic program, which focuses on systems thinking science. "Our innovation courses highlight a skills-based discipline based on proven engineering principles that build a platform from which entrepreneurial talents, new discoveries, and problem-solving abilities thrive," said David Crawley, professor of practice at the UH College of Technology. Crawley said that the workshops are designed on the premise that students learn by doing. The courses begin with fundamentals, and sequentially move through the disciplines of create, communicate, and commercialize, which guide participants toward recognizing and managing solutions that inspire innovation. In the classroom, Crawley’s assignments involve structured creativity to help students realize the world in new ways, find hidden patterns, detect associations to form new solutions, and cultivate meaningfully unique ideas. The challenge to the students is to figure out how to recognize environmental compositions and use various techniques to define new approaches to real world situations. 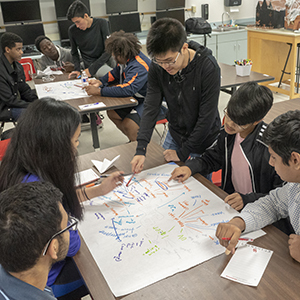 Following a session at Austin High School on November 8, Yvette Ramos, career and technical education instructor said, “This workshop taught students to think outside the box and use mind mapping skills, which provided a new view on their own projects. My students are still having conversations about what they learned in the workshop." "We are pleased to support our colleagues in Fort Bend County as we work together to champion the public welfare and the future of the region," said Dr. Anthony Ambler, dean of the UH College of Technology.